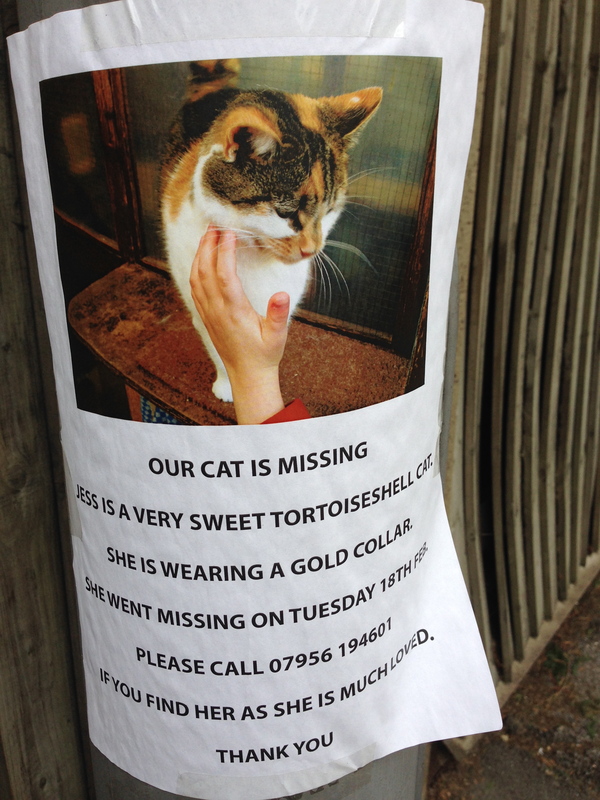 Elaine saw this poster about Jess, a tortoiseshell puss, who went missing on 18th February in the Southborough area of Surbiton. It would be great if you could keep a look out for her and call her people on 07956 194601 if you find her. Sorry – don’t know their names. I know what it’s like to be lost. And it isn’t nice. I’d popped along to see my brother, Felix, who lives a few doors away. I went in through the cat flap, had a good look around, but couldn’t find him so I decided to go home for breakfast. But the cat flap was locked and I was stuck. I went up to one of the bedrooms to wait for the family to come home, but nobody came. I heard strange voices and hid. Whoever it was walked around – think they had come into to look for me – then horror of horrors they closed the door to the bedroom so I was trapped in there! I ‘d been stuck in there for two days when I heard Elaine’s voice so I called out to her as loud as I could and she found me. She seemed very, very happy to see me! I found out later that Lyndsey and Clive had gone on holiday and Felix was in the cattery. They’d left the cat flap unlocked so he could get in but had locked it from the inside so he couldn’t escape when he saw the dreaded basket (we felines know it’s never good news when the basket appears). Graham and Elaine were very upset. They made posters with a picture of me on them (I have to say, it was a very cute shot – caught my best side purrrrrfectly). They pushed them through doors and pinned them to trees in all the roads around here. When they found me they made another poster to say I’d been found. It seemed to go down very well because I got two cards, from two dogs who live down the road who said they’d been looking for me (I just bet they had!) and several phone calls from well wishers. 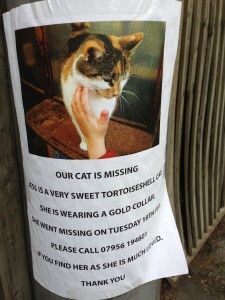 It’s really sad to see posters of missing kitties, so it’s nice to let people know there’s a happy ending. I hope Jess is found in good health very soon. This entry was posted in Missing cats on February 24, 2014 by MrMonty2014.